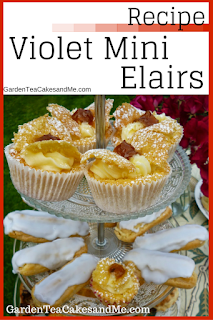 I have discover choux pastry with this easy bake Mini Eclairs with violet essence icing. I was inspired by the Rose Eclairs I had at my Fortnum and Mason Afternoon Tea, this was my first time at making choux pastry, which I have to say is one of the easiest pastries to make - or is that just beginners luck. This recipe creates a light fragrant petite cream cake, that taste of Summer. The Mini Violet Eclairs recipe was the perfect edition for the recent Afternoon Tea held in the garden last month. Heat oven to 200 degrees c.
Remove saucepan from heat, add flour and stir quickly. The mixture will form into a soft dough, leaving the saucepan sides clean. Allow to cool slightly, then gradually add the egg and beat hard until you have a smooth and shiny mixture. Place the mixture into a piping bag, use a wide round nozzle or just snip the end off a piping bag. Pipe onto the lined baking tray. For the mini eclair pipe the mixture to a length of 8 cms. If you do not have a piping bag then use spoons dipped in water and place blobs of the mixture you will end up with choux pastry like those used in profiteroles. If your piping is not very even or one of the ends is sticking up, dip a fork in water and slightly even the piped mixture. But do not squish it! Bake in oven for 10 minutes on 200 degrees c. Bake for a further 12 minutes on 180 degrees C.
Turn off oven and remove pastry from oven, make a small slit at the end of each eclair, then place back in oven to dry out for 5 minutes. Then leave to cool on a wire rack. Fill the choux pastry fingers with double cream, whipped to a thick but soft consistency, so that you can still pipe it. You can either pipe the cream into the choux finger using a special eclair nozzle. Or you can cut the choux finger in half sideways and then add the cream. You want to aim for a thick but spreadable consistency. gradually add the water to the icing sugar, mixing gently at first then whisk well to remove any lumps. Add the drop of essence, taste the icing to see if you need a drop more. Add a tiny amount of the food colouring, you want to a achieve a light lilac colour. You should have a thick but spreadable consistency. Either spread the icing with a palette knife or dip the eclair into the icing to cover the top. Leave to set on a wire rack. I would love to be eating these right now, after 10 days away, I want to eat everything! Oh yum! 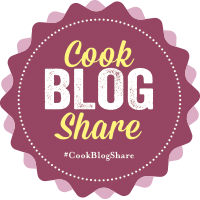 You have just reminded me that I really need to make some gluten-free choux pastry and these eclairs would be a good recipe to do! Thanks for sharing! What a beautiful setting for an afternoon tea. Your eclairs look very lovely. Eclairs and choux are my weakness and favourites since I was little. I have to say I find eclairs a lot trickier to pipe successfully but yours look perfect.